We decided to go for seafood since we were in the desert. Something about this caught our eye… perhaps the brilliant hues of the neon sign blazing the word wildfish in the hot Arizona night. It is located in a development called The Waterfront although we didn’t see any water. The interior feels like a Las Vegas dinner club set with high ceilings, dramatic lighting and big plush booths lining the dining area. The wait staff were all wearing rumpled white jackets with a miami vice look about them, in fact looking around the room it felt as if we were on the set for a bad tv show. Lots of blonde hair, fake tans, and unnaturally white teeth. I ordered the Wildfish All Lump Crab Cake which was huge and had a deliciously crispy fried panko bread crust. 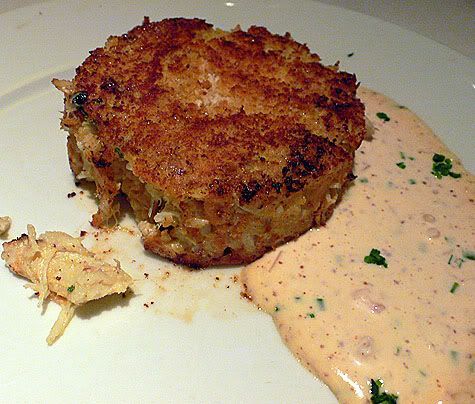 It was full of succulent crabmeat and served with rich creamy Chive Remoulade Sauce. I liked it a lot. 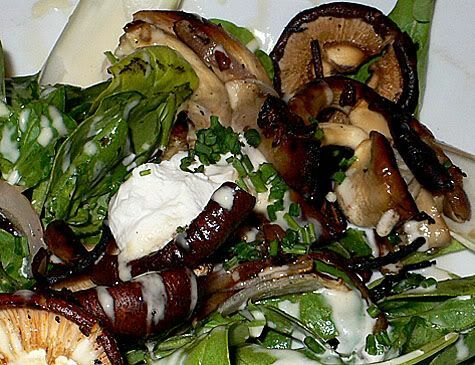 I also had the Hot Goat Cheese & Wild Mushroom Salad, which looked good and smelled fabulous. The large whole mushrooms had been lightly pan seared with caramelized onions, then thrown in with greens and tossed with Champagne Vinaigrette. The fresh shiitake and oyster mushrooms were huge and hardly cooked, although some of the edges were browned and savory. I was able to cut off the cooked parts and assemble some very good bites, but overall it was inedible. I’m no mushroom hater, but I’m not a fan of eating whole raw oyster or shiitake mushrooms and I probably should have sent it back. 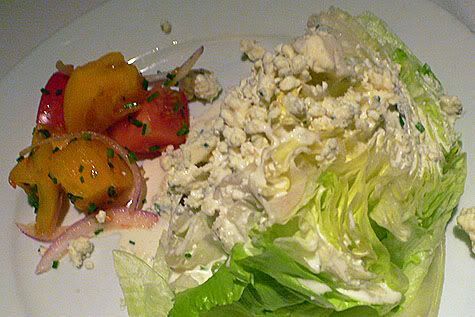 Iceberg Wedge with Buttermilk-Blue Cheese Dressing Tomatoes, Red Onion and Chives. This had a fine ratio of cheese and dressing distributed over the large wedge of lettuce. 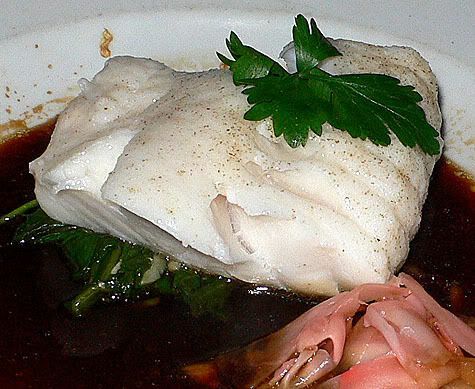 BG and JY ordered the Chilean Sea Bass, served steamed Hong Kong style in a light soy broth and sesame spinach. The the delicate meat was perfectly accented by the broth and melted in your mouth. 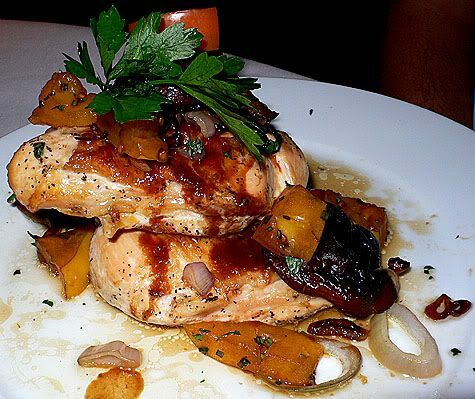 AC had Roasted, Double Breast of Chicken, which came with Roasted Mushrooms and Natural Jus. It was a very big portion, but cooked to perfection. 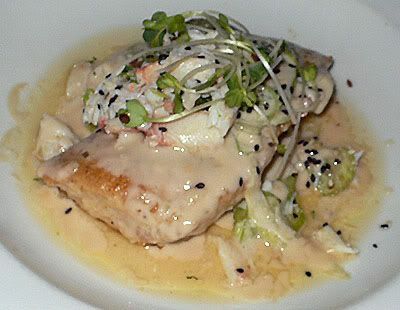 Sauteed Hawaiian Butterfish with Fresh Jonah Crab and Celery Salad and a Coconut-Lime Broth. We ordered several different side dishes, which were all large enough to share. 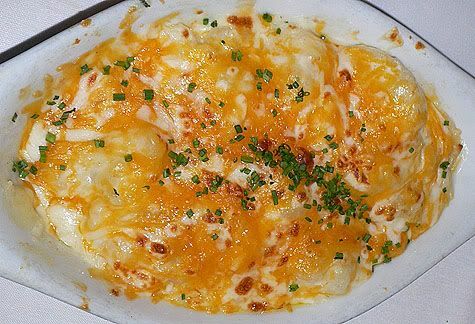 Scalloped Potatoes Au Gratin were rich and creamy with gooey melted cheese on top. 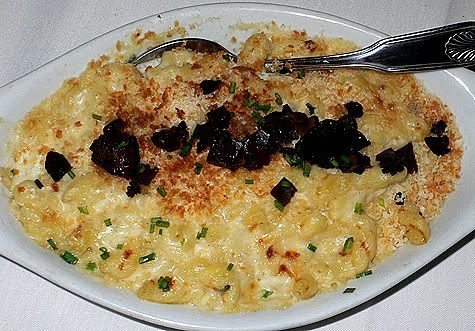 The Truffled Macaroni & Cheese “Gratinata” was also decadently rich and creamy and you could taste the strong garlicky flavor of truffle oil. 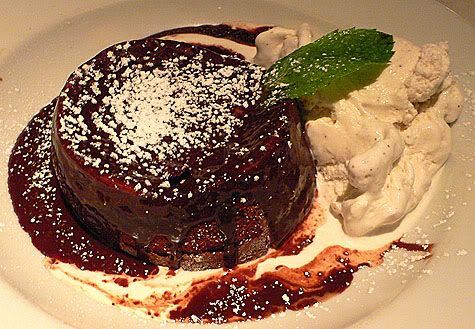 It was garnished with sliced black truffles from a can and crunchy toasted bread crumbs. 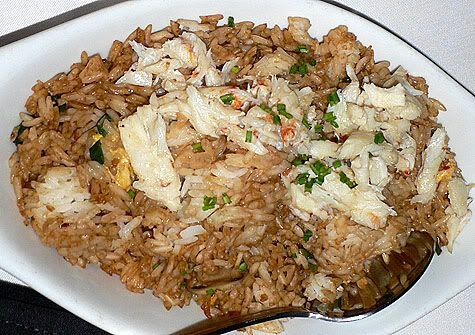 I only took a small bite of the Crab Fried Rice with Scallions & Mushrooms, which seemed to be flavored with just soy sauce and some chives. 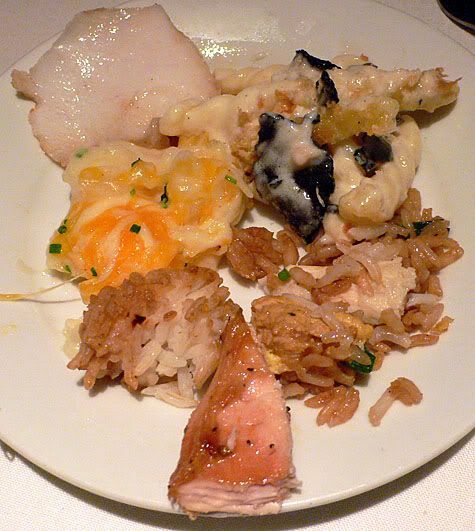 My sampler plate was delicious. It was a surprisingly good seafood meal in the desert and we enjoyed observing the wild western ambience going on inside of the restaurant, it was a good place for people watching.